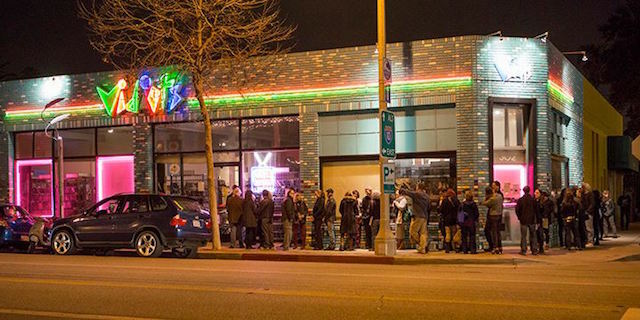 After almost thirty years of operation and weathering the many challenges that video stores face in the Netflix age, Vidiots in Santa Monica announced that they would closing their doors this spring. "It is with profound regret and sorrow that after 30 years in business, Vidiots will be forced to close on April 15, 2015," wrote co-founders Cathy Tauber and Patty Polinger in an email sent out Monday morning. Vidiots opened on November 15, 1985, founded by childhood friends who shared a passion for movies and wanted to shared the movies they both loved. Through the decades, the store grew from an inaugural 800 videos to the 50,000 titles they have today—many rare, out of print, and otherwise unavailable. Started on a modest budget, the name Vidiots partly came about because it was small enough to fit on a sign Tauber and Polinger could afford. Despite being the home of the movie industry, there were no video stores in Los Angeles in the mid-80s that catered to arthouse-inclined cinephiles and they quickly filled that niche. "We wanted to differentiate ourselves from the beginning," Polinger told LAist. Polinger recalled once renting a beat-up, damaged tape of the 1979 Carlos Diegues film Bye Bye Brazil, only to go back a few weeks later and find her only option to watch the movie was the same tape. "I had just gotten a VCR and was frustrated there wasn&apos;t more choice out there." Their deep and eclectic collection help them survive the 90s wave of video rental chains, such as Blockbuster and Hollywood Video. 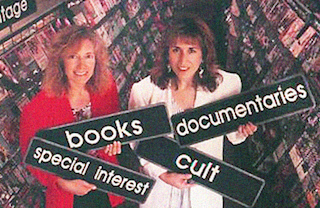 Mom and pop video rental stores closed in droves, but as Cathy Tauber says in the video Rewind: The Story of Vidiots, "We ended up getting this big jump in business," simply because they provided what Blockbuster could not. Because of their enormous selection, they amassed a clientele that ranged from casual movie fans to Hollywood filmmakers. Sadly, the turn of the 21st century marked the beginning of the end for Vidiots. "We feel like this has been looming since 2010," said Polinger. In 2012, with the help of film director David O. Russell, Vidiots became a 501(c) non-profit and was rechristened The Vidiots Foundation. Prior to the reorganization, the store was already hosting many events for the community, including free screenings, conversations with filmmakers, and video production classes so the transition felt appropriate. Their free lending library of books on film is named after Russell. Despite this the store continued to run a deficit as the media landscape continued to evolve, with a 24% drop in rental income in the last 5 months according to the email sent this morning. "Crisis mode came in the last six months." Polinger doesn&apos;t feel that there&apos;s a single thing that can be pointed at to explain the demise of Vidiots, but the world of technology is at the heart of it. "I think it was just a confluence of different things. Ease of streaming, the advent of good TV, the DVR, all of it. Movie studios are facing similar issues as well, and trying to get people to the theater." Moving forward, one hopes that Vidiots&apos; massive collection will remain intact and Polinger hopes it doesn&apos;t go the way of the hallowed collection of New York store Mondo Kim&apos;s, which is now collecting dust somewhere in Italy. "We will be contacting people and just hope that we can keep the collection together," said Polinger. "My hope is that we can keep it in the community." Although the era of the video store had long passed well before this news, it still always brings sadness to the hearts of people when the last remaining vestiges of the past finally depart. "I do feel that there will be a void in the community. I feel a sadness not just for myself, but a sadness for the small mom and pop community based business that is no more," said Polinger. Although Polinger&apos;s voice has a natural ring of optimism to it, she&apos;s not holding out hope. "It would only take one person who had the means... but I&apos;m not sitting here waiting for that phone call."